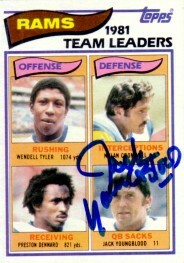 1982 Topps Los Angeles Rams Team Leaders autographed in blue marker by Hall of Famer Jack Youngblood. Obtained in person. With certificate of authenticity from AutographsForSale.com. ONLY ONE AVAILABLE FOR SALE.